Most everyone has a credit or debit card. If you are a small business you more than likely also have a business credit card to make important purchases. Having the ability to manage your account at any time from any location is an important feature, which makes having a credit card mobile app necessary. Two of the top credit card mobile applications come from Chase and American Express. Making a deposit is easy with Chase QuickDeposit by giving you the ability to deposit a check using your iPhone or iPad camera. Chase Person-To-Person QuickPay allows you to send money to nearly anyone in the U.S. with a bank account simply by using their email address or mobile phone number. Other advantages to the Chase Credit Card mobile app is that you can pay bills and credit cards through the mobile interface and view your account balances. 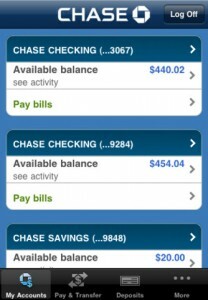 The app also helps you locate a Chase branch or ATM and quickly transfer money or make a deposit. One big disadvantage to the Chase Credit Card mobile app is that you are only allowed to deposit $1,000 a day and $3,000 a week. For the small business owner that means your trips to the bank are not totally eliminated. The Chase app is free to download for iPhone and Android. Click here to read the Chase Credit Card full review. 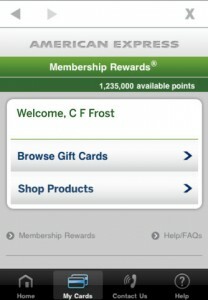 One advantage to the American Express mobile app is that you don’t have to first set up your online banking from a desktop computer. You can log on with your banking credentials and get started right away from your iPhone or other mobile device (it is also available for Android and Blackberry). Disadvantages to the American Express mobile app is that not all versions of the Android operating systems are supported nor is the Apple iPad. Click here to read the American Express Business Credit Card Review. For more information on business credit cards, visit our Business Credit Card Comparison Chart.